I love the Brusho Colour Crystals in the new Occasions Catalogue and have been having fun experimenting. In previous cards, I've made backgrounds and in this one I tried to use it in a slightly different way. 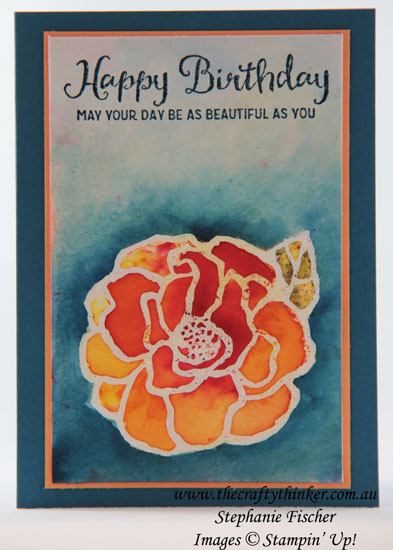 The beautiful bold flower from the Beautiful Day stamp set was white heat embossed on watercolour paper. I then brushed water onto the flower and sprinkled on a couple of different Brusho colours as well as green onto the leaf. Once the flower had dried, I mixed some blue Brusho crystals with water on an acrylic block and used a damp paintbrush to apply the colour to the background - picking up more pigment and dropping it near the flower. The greeting, from the same stamp set, is stamped in Dapper Denim ink and the panel was adhered to a Peekaboo Peach mat before being adhered to the Dapper Denim base card. Both the stamp set and the Brusho Colours will be available from 3 January 2018 in the new Occasions Catalogue.